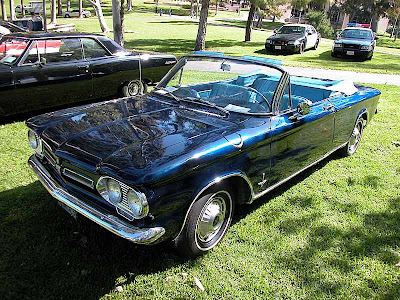 Cars I Have Owned: Cars I Have Owned #2 61 Chevy Corvair Monza. Labels: 61 Chevy Corvair Monza. My 2nd car was a Chevy Corvair Monza. This pix is actually a '62 and mine was a '61. I loved this piece of junk. It was one of the first American cars with bucket seats and 4 on the floor not to mention the air cooled rear engine. It's also the car Ralph Nader wrote his book about called, Unsafe at any Speed. It was one of the first "compact cars. "I bought it used. Think I did considerable damage while learning the gears driving uphill on Snake Road - smoke started to pour out of the dashboard.